Across northeastern Japan, men, women and children that were displaced by the Tohoku Earthquake are taking shelter in refuge centers. Adults might want warm baths and cigarettes, but, according to reports, little kids want video games. Little kids like Haruka Onodera (pictured). She's smiling and seems like your typical happy kid. There's a cute drawing she made. 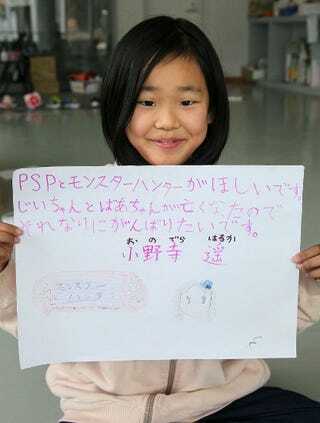 "I want a PSP and Monster Hunter," reads her childlike handwriting. This isn't her Christmas wish list, however. And her story is apparently anything but happy. The sign she's holding also says her grandfather and grandmother died and that she wants to remain steadfast. Online, Japanese netizens are impressed how strong the girl is, while others point out in a snarky fashion that she isn't old enough to play Monster Hunter due to the game's rating. One Japanese celebrity, Masahiro Nakai from boy band Smap, visited a shelter in Fukushima, reports Cyzo. He did some volunteer work, cooking and brought along presents like Nintendo DS units and remote controlled cars for the kids. For the adults, he brought things like a massage chair and cigarettes. The five members of Smap have together donated over 400 million yen, which is one hundred million yen more than Nintendo. Another idol group, AKB48, also donated more money as well.